Back in July, Malaysia Airlines Flight 17 was shot down over Ukraine, killing all 298 people on board. We showed you some Digital Globe imagery of the crash site, which has since, in addition to other images, been added to Google Earth’s historical imagery. It is generally believed that flight MH17 was shot down by pro-Russian separatists using a surface-to-air missile, but Russia has put the blame on the Ukrainian government. Official investigations into the crash have not yet made any findings as to who is responsible. Last Friday, November 14th, 2014, Russian state television aired a story in which they showed satellite imagery purported to be of Flight MH17 being shot down by a fighter jet. However, it seems pretty clear that the image in question was a poorly done fake. For the full story and analysis of the imagery see the the article on bellingcat here. We have created an image overlay of the photo for you to view in Google Earth which you can download here . 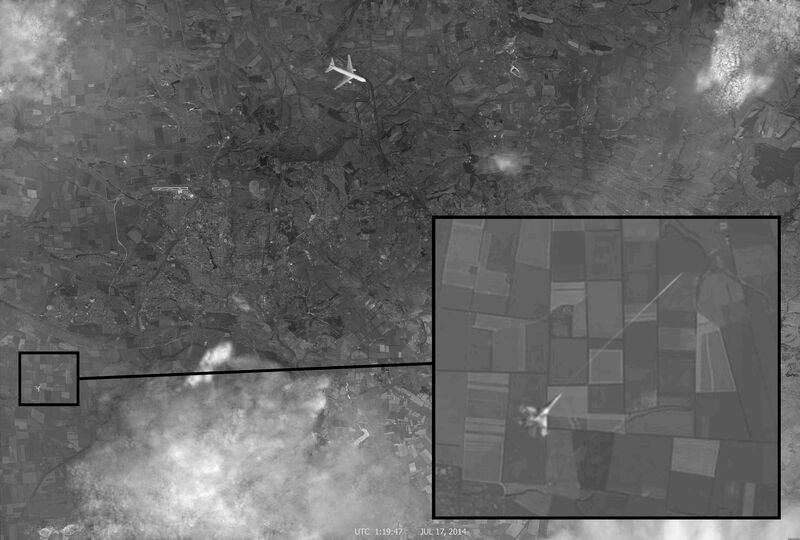 The picture that supposedly shows a fighter jet shooting down flight MH17. A high resolution version can be found here.